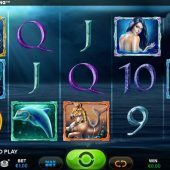 Neptune Rising slot from Microgaming is typically from their in-house developers as all their output has been of late and most of that has been Book of Ra Deluxe based stuff. These games include Bookie of Odds and Book of Oz but we have a new name here - Plank Gaming. Yes, you read that right and I didn't believe it either! Yet again we have the familiar model but in this case it's possibly been the best one so far despite the developer's moniker. The reels are transparent and lie over a dark coastal seascape with gloomy classical music and thunderbolts as our soundtrack, but will Neptune dash our bankroll on the rocks too? 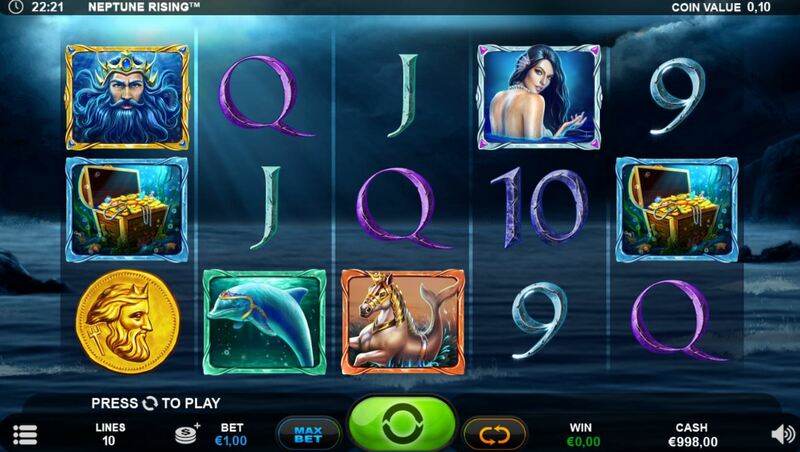 There are 10 fixed pay lines on Neptune Rising slot and single symbols although as we will find out these can randomly expand. The volatility here is indicated by the 5-of-a-kind pays which are 75x bet for Neptune or Siren, 40x Sea Horse, 25x Dolphin or Treasure Chest, 12.5x Ace or King and the lower four card values pay 10x for a full line. Wilds appear on all reels as do Gold Coin scatters and the Wilds will pay a huge 900x for a full line! There is more to this slot though than the usual expanding scatter free games. On any non-winning spin you may see one of two different modifiers. With a a crash of lightning Neptune appears from the sea under the grid, trident raised to enhance the spin. Near Miss Scatters - Neptune may rise if scatters appear on two reels and grant you 1,2 or 3 more for a trigger. Symbol Near Miss - on a near miss of any symbol, Neptune can rise up and reveal them in the right places to award a win. You get 10 free games for 3 or more scatters with a guaranteed win every spin. Neptune reveals 9, 10, Neptune, Siren, Scatter and Wild as these all pay for 2-of-a-kind. He then reveals J, Q, K, A, Dolphin, Treasure Chest and Sea Horse as these need 3-of-a-kind for a win. On every spin you will see either the first 2 or 3 reels populated by Neptune with one of those awards described above, effectively giving you a 10x multiplier for them due to having 10 lines in play. Once the reels have been placed there, the remaining 3 or 2 reels spin to see if you can increase the pays by matching more symbols. You can retrigger this round too.